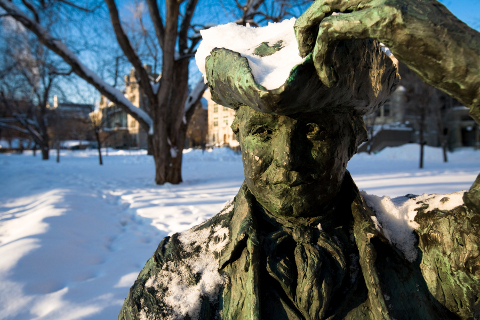 Founder James McGill (1744-1813) steadies his hat and stands watch over the Downtown Campus.James McGill accomplished many things during his lifetime. He carved a new life for himself in the Canadian wild while barely out of his teens. He flourished as a fur trader, despite tough and dangerous conditions. He was a husband and stepfather with a strong dedication to public service. But of all his accomplishments, there's one that Governor General Award-winning novelist (and McGill English professor) Hugh MacLennan called “the most important act of his life”: James McGill wrote his will. As dedicated as he was to his adopted home, James McGill wasn’t blind to Montreal’s shortcomings. Around 1787, he drafted a petition calling for improved education. “We hardly know of a single school in any part of the district for teaching boys,” he wrote. “Only one boy in five can read and write.” Grateful for his own education at Glasgow University during the height of the Scottish Enlightenment, James McGill bequeathed in trust £10,000 and his forty-six acre Burnside Place estate on the side of Mount Royal, to the Royal Institution for the Advancement of Learning upon his death. There were two conditions: The resources were to be used to create a college in McGill’s name, and the school must be established within ten years of his passing. James McGill died on December 19, 1813, less than two years after writing his will. But for all his foresight, the genesis of the college bearing his name was a difficult, drawn-out affair. One of his heirs, a nephew named Francis Desrivières, was eager to claim Burnside Place as his own; he artfully hedged and stalled all progress, in the hope that the Royal Institution would miss its ten-year deadline and the McGill fortune would default to him. The Royal Institution, meanwhile, was a fledgling operation ill-equipped to deal with its own day-to-day operations, let alone do battle with the uncooperative Desrivières. It was thanks to the rallying efforts of McGill’s former fellow fur trader, John Strachan, that the Royal Institution pulled itself together and obtained a charter from King George IV in the spring of 1821. Three years later saw the appointment of a principal, Reverend George Jehosophat Mountain (later Anglican Bishop of Quebec), and the hiring of four professors. Now all the Royal Institution needed was the school itself. On June 24, 1829, Burnside Place was formally opened as McGill College. The college immediately struck a deal to have the Montreal Medical Institution act as its faculty of medicine. James McGill’s dream was picking up steam, although it would take another six years to settle the case with Francis Desrivières, and internal bickering would cause even further delays. Finally, on September 6, 1843, twenty students filed into the new Arts Building. It was McGill College’s first day of classes, an historic moment thirty years in the making.